Waste Available to Site = To Be Determined. 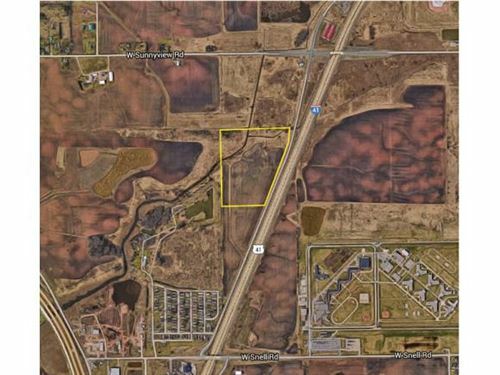 Prime Interstate 41 frontage for development. This acreage is ideal for your industrial warehouse/distribution needs. Sewer and water will be available to the site. Acreage can be split into smaller parcels of 5 acres or more. Owner will also consider a build to suit option. Jackson Street to West Snell Road to Green Valley Road. $11,760 would be your approximate monthly principal and interest payment. This payment is based on a 30-year loan at a fixed rate of 4.12 % with a down payment of $269,500. Actual lender interest rates and loan programs may vary.